How to Recover System If No Dell Factory Image Restore Option? Why there is no Dell Factory Image restore option in my computer? Here you can learn how to find Dell Factory Image restore option and how to recovery dell system easily. It is not strange that computer happens something wrong. With computer is used widely, it is required to store more and more data and run many software. Therefore, some accidents will be encountered during you use computer. But, what may drive you crazy is not computer crashing, but that you can’t find a way to solve it. "My computer finally breaks down, and it can't boot. I don't want to send it to repair, but I don't know reinstalling system either. I have heard that there was one key recovery function. I searched all applications in computer, but there is no Dell Factory Image restore option. Why?" This thread in the forum is promoted and of course it receives many answers. 1. ClickStart, type cmd in the search box, right click the program and click “Run as administrator” to open a command window with Administrative rights. 3. Then, press Enter to execute the command. 4. Type Exit and press the Enter to close the command window. Finally, restart your system. And you should now see the Factory Image Restore option in the Windows Recovery Environment menu, and use it to recover Dell factory image. How to Recover system if there is no Dell Factory Image Restore option? It is good to find Dell Factory Image Restore option. But here, we'll provides you two ways to restore Dell system image for "no Dell Factory Image Restore option". 1. Start up or restart computer. before computer enters system, press F8 to enter windows “Advanced Bootable Option”, and then, select “Fix Computer”. 3. If there is administrate password in computer, You have to input it; if there is not, just select ”OK”. 4. After entering System Recovery Option, select “Dell DataSafe Recovery and Emergency Backup”. 5. Select “Other System Backup and More Option”, and then, click “Next”. 6. Select ”Restore My Computer” and click “Next”. 7. Choose right factory system image, and then, click “Next” to restore system to factory setting status. Tips: If you are laptop, you’d better connect to AC adaptor. After computer finishing recovery, you can restart computer. The steps seem to be too complicated to computer novice. if you want to use more simple way, AOMEI OneKey Recovery will be good choice. 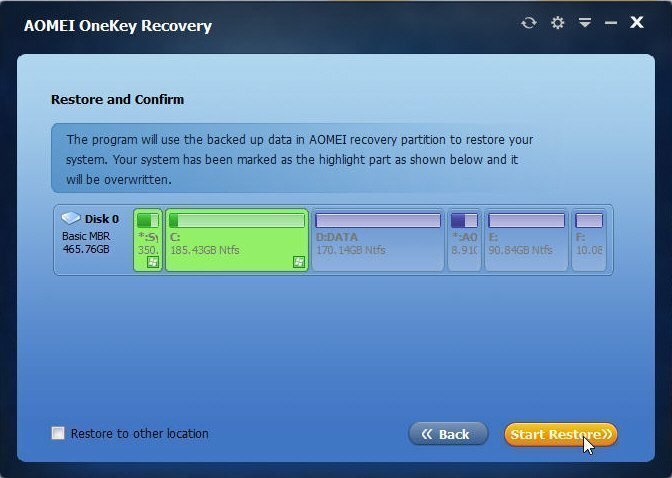 Different from some branded recovery software, AOMEI OneKey Recovery is third-party recovery software, which can be installed in any type of laptop or PC for onekey system backup and recovery. It can backup system to factory partition or other location with onekey, and recover your operating system including all your applications, drivers and all personal data to the initial state. If you want to backup or restore system on Dell computer, you either need Dell Factory Image Restore option, or restart computer. The AOMEI OneKey Recovery tool will simply backup and restore your system for PCs and Servers. 1. 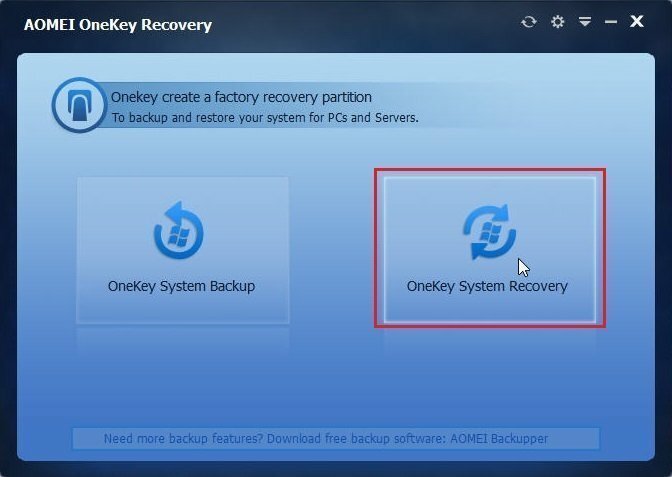 Install and launch AOMEI OneKey Recovery, you can use it to make a factory recovery partition with "OneKey System Backup" first. With the recovery partition, you can factory restore system with OneKey System Recovery. click it in the main interface. 2. Then, you can choose a way to restore your system and click Next to continue. Considerring that you have created a factory partition, you can choose the first one to recover Dell factory image. Tips: the second one is for the system backup image not in the factory partition. 3. 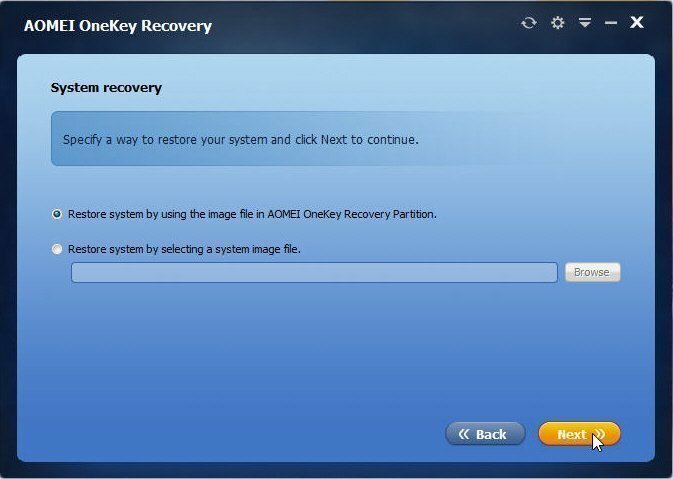 The program will use the system backup image file in AOMEI OneKey Recovery partition to restore your system. You can restore to the original location, or you can restore to another location if you have other disks. 4. Click Start Backup, and it will execute the task restore Dell sytem image. Wait till the progress done. Using Dell Factory Image Restore would help you restore Dell computer to the original state easily. But when the Dell Factory Image Restore option missing in Windows Recovery Environment, you can take those two ways to recovery Dell factory image easily. You will find that AOMEI OneKey Recovery is a good alternative to Dell Factory Restore function.